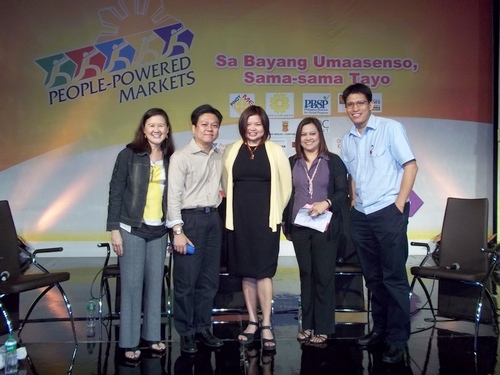 In commemoration of the 25th Anniversary of EDSA Revolution, the Ninoy Cory Aquino Foundation (NCAF), in coordination with PinoyME (Pinoy Micro Enterprises), holds a 3-day People-Powered Livelihood Movement at the NBC Tent/Global City to assist NGO’s and the public through business development services. In one of the sessions on 23 Feb. 2011, PAGASA Pres. 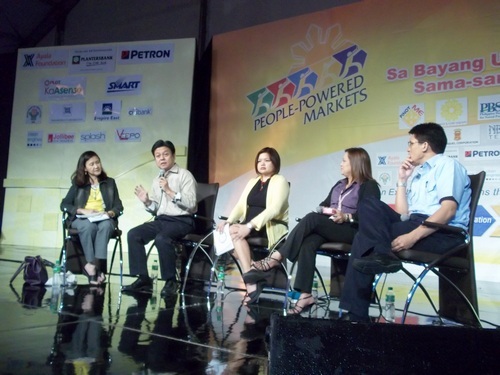 STC is invited as a resource person together with (L-R) the moderator and representatives of SMART Communications, Splash Direct Sales and Petron Stations in offering business opportunities to the partners/beneficiaries of NGO-attendees. STC gave pointers on how to get products on the Shelves of supermarkets even for Microenterprises.